Ideal for shooting large building exteriors, narrow interiors and vast natural landscapes, this f/4 fixed-aperture zoom lens delivers consistent exposure, tack-sharp images and vibrant colors. 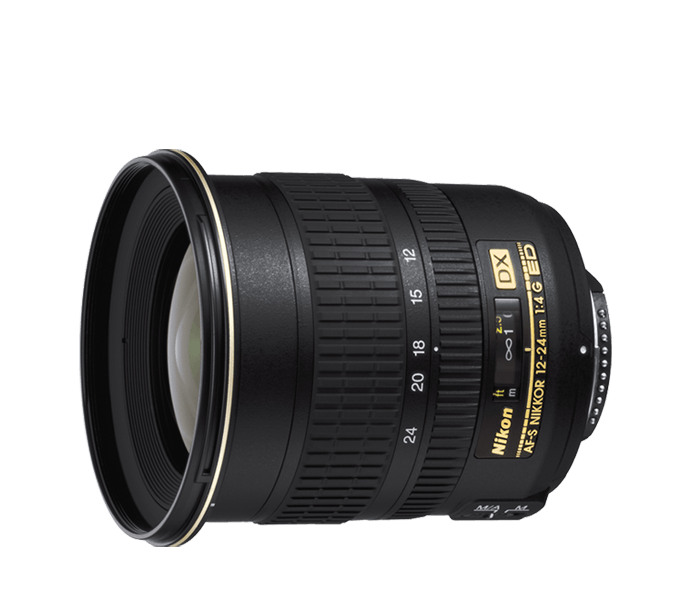 Optimized for DX-format cameras, the AF-S DX Zoom-NIKKOR 12–24mm f/4G IF-ED is a popular choice for travel, architecture and landscape photography; and establishing shots when recording HD video. Whether shooting stunning natural landscapes, dynamic interior spaces or expansive building exteriors, the AF-S DX Zoom-NIKKOR 12–24mm f/4G IF-ED delivers a dramatic wide-angle perspective and tack-sharp, color-rich images. Rugged, lightweight and versatile, the AF-S DX Zoom-NIKKOR 12–24mm f/4G IF-ED is a fantastic travel and adventure companion. The AF-S DX Zoom-NIKKOR 12–24mm f/4G IF-ED combines a wider angle-of-view with optical characteristics that are optimized for advanced DX-format Nikon D-SLR camera sensors. The lens produces a smaller image circle (the size of the image projected onto the sensor), enabling a smaller lens diameter and optimal image quality from center to edge to corner. Its rounded diaphragm makes out of focus elements appear more natural, and its Extra-low Dispersion (ED) glass ensures superior sharpness and color performance.